The sportsbooks decided not to post odds on regular-season championships for individual conferences this college basketball season. That decision, borne out of a mix of laziness and general incompetence, was a surprise. As conference odds betting has been a part of college basketball for as long as I could remember. However, if the books had gotten it together and posted odds to win the Mountain West, I think that Nevada would've been somewhere around -2000, a virtual lock. Sometimes having one team that large of a favorite can be a negative for a league. After all, where is all the fun when you already know which team is going to win the title? That is not always the case, though. And having a Top 10 team from the Mountain West can only help to up the profile from this flagging league. The Wolf Pack begin the college basketball season as the No. 7 team in the country, according to the AP Top 25. And they have a legitimate chance to earn a No. 1 or a No. 2 seed in next year's NCAA Tournament. 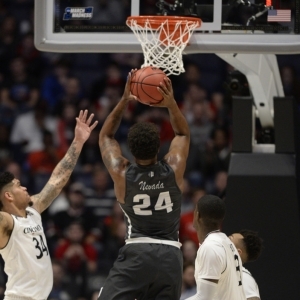 That means that the MWC will have the spotlight shine on it several times throughout conference play, especially when Nevada faces in-state rival UNLV or long-time rival San Diego State. Yes, it is a foregone conclusion that Nevada will win the MWC. But just because you know the ending of the movie doesn't mean that you won't still watch it and be entertained. I mean this sincerely: this Nevada team has the chance to be one of the best mid-major teams that I have ever seen. I don't say that lightly. They have four starters back from last year's Sweet 16 squad, including twin brothers Martin, Caleb (18.9 points per game) and Cody (14.0 PPG). Jordan Caroline and his 17.7 points per game also return. Nevada added five outstanding transfers in TreShawn Thurman (13.8 PPG), Corey Henson (14.6 PPG), Nisre Zouzoua (20.3 PPG), Trey Porter (13.2 PPG) and Jazz Johnson (15.8 PPG). Think about that for a second: this team will start the year with eight guys that have averaged at least 13 points per game at the college level. Oh yeah, and there is Top 15 freshman Jordan Brown. The fact is that Nevada's biggest issue might be the fact that they have too many good players and only one ball! This team can go 10-deep without breaking a sweat. They have depth, experience and overwhelming talent at literally every position. If Eric Musselman can get everyone rowing in the right direction, this team is absolutely good enough to win a National Championship. The Aztecs got off to a pretty ugly start to the Brian Dutcher Era, opening the year 13-10. But something clicked in mid-February and SDSU won their last six regular season games before plowing their way to the conference tournament title. They will hope that momentum carries through into this season as Dutcher continues to move the Aztecs away from the extremely successful Steve Fisher Era. Devin Watson and Jalen McDaniels form a solid inside-out combo. These guys are pretty young beyond Watson and Jeremy Hemsley, though. There are eight freshmen and sophomores that will determine what the future holds for Dutcher and the Aztecs even if the present is full of growing pains. I know a lot of people were skeptical of Marvin Menzies' hiring at UNLV. I was not. I think he's a good coach with a distinct vision of how he wants to create his roster and how he wants his teams to play. Now in his third year, Menzies has the Rebels looking more like the squads that he had so much success with at New Mexico State. UNLV is big, athletic and versatile. Shakur Juiston is the perfect embodiment, and the 6-7 forward averaged 15 points and 10 rebounds per game last season. Menzies will also lean on Top 100 recruit Bryce Hamilton and several international imports. No one is going to catch Nevada. But UNLV will be competitive at the top of the league and they are setting themselves up to be a force within the next several seasons. Paul Weir's Lobos weren't all that good last season - they went just 19-15 - but they sure were entertaining. The Lobos scored 82.2 points per game, good enough for No. 22 in the country, and had six guys score 9.5 points per game or more. Four of those guys are gone. The hope was that transfers would pick up the slack. Then Chris McNeal had his appeal denied and JaQuan Lyle blew out his Achilles. Well-traveled Carlton Bragg won't be eligible until December. And the hope is that Vance Jackson can contribute right away. Is Weir's style more important than the substance on the roster? We will find out. It was a bit of a red flag when head coach Rodney Terry, who had won 20 or more games in four of five seasons (and three straight) decided to leave Fresno for the UTEP job. Had Terry moved up in the world, it would've been understandable. But UTEP is arguably a step down. So what gives? Fresno filled the vacancy with Justin Hutson, who is more of a recruiter than a coach. And Terry left behind a roster that has one great player (Deshon Taylor) and then a bunch of below-average ones. I don't see Fresno cracking the 20-win threshold again this season, and I think the arrow is pointing downward for this program. Boise State - The Broncos will have to figure out a way to soldier on without Chandler Hutchinson and his 20 points per game. They also graduated Chris Sengfelder and Lexus Williams, and they return just one guy that averaged more than nine points per game. Last year's role players are going to have to expand their games. But having watched this team closely, I don't know if they have it in them. The Broncos won't fall off the map. But their ceiling is decidedly lower now without the talent or experience they've been wielding the past two or three years. Wyoming - Head coach Allen Edwards really has done a great job in keeping this Wyoming team competitive in the post Larry Shyatt-era. He's posted back-to-back winning seasons despite an overmatched roster. And his more open style, compared to Shyatt's grinding approach, has been a welcome change. Justin James is one of the best players in the league. And whether or not he gets any help from the youth movement that Edwards is turning to will decide if the Cowboys can make it back to the NIT. Utah State - The Aggies have another new coach, and they are still trying to find their way in the Mountain West. Junior Sam Merrill gives them a glimmer of hope. But there simply isn't enough athleticism or size on this roster to keep them competitive with the guys that are running and jumping over them from some of the better programs. There's very little to get excited about with this group, outside of seeing what new coach Craig Smith has to offer. Colorado State - Larry Eustachy's final season at Fort Collins was an unmitigated disaster. Now Niko Medved, formerly of Drake, is here to pick up the pieces. Medved does inherit an upperclassmen-laden roster. But they were all players recruited for a very different system and style than what Medved wants to play. Medved is no slam-dunk hire, either. He's on his third school in three years. He's finished better than .500 twice in five total years. I'm not holding my breath that any sort of quick turnaround is imminent, even with four guys on the roster that averaged between 8.9 and 10.4 points per game coming back. Air Force - The Falcons definitely take an old school approach to college basketball. From their antiquated Princeton offense style to their recruit-and-develop approach, Air Force is hooping like its 1988. They bring in freshmen. Those guys play a little bit as sophomores. And the hope is that by the time they are juniors and seniors there is enough there to make a run at .500. I wouldn't hold my breath for this year's team clearing that bar. San Jose State - I'm not going to waste anyone's time talking about the Spartans. They went 4-26 last year and could somehow be even worse this season. This has been one of the worst programs in college basketball for most of the last 20 years and I see no reason why that will change this year. Robert Ferringo is a member of the Basketball Writer's Association of America and a professional sports handicapper for Doc's Sports. He is considered one of the best college basketball handicappers in the country and has an unrivaled run of 11 of 12 winning nonconference seasons and 10 of 12 winning regular seasons. Robert's $100-per-Unit clients have banked a remarkable $61,300 in the last 12 years with his nonconference picks (November and December) alone. There is no better moneymaker in the nation and Robert is looking forward to another amazing season. You can sign up for his college basketball picks and get more information here.